I need more books like a need a hole in the head, but I got tired of waiting for these to come in at the library, and went out and bought them! Check out these beauties. Gorgeous, eh? I'm justifying the purchase by thinning down my collection at home... just donated a box of paperbacks to make room for these on my shelf. I like your logic :) I loved Supernaturally! It's not as action-oriented as Para, but I still liked it a lot. I hope you do, too! Yay Supernaturally! I have that one too and I can't wait to start it:) I need to read White Cat too, I've heard that series is amazing. Enjoy all those books! 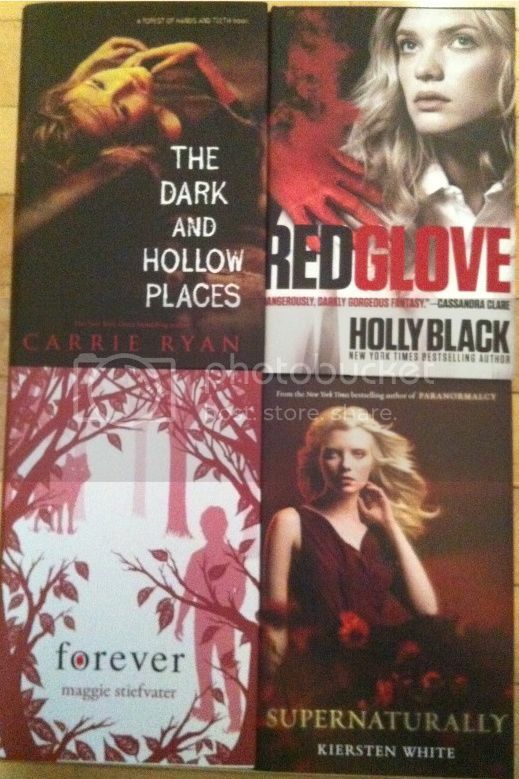 Ah, all four of these series I have not read, but I'm really interested in reading The Forest of Hands and Teeth! I have yet to read The Dark and Hollow Places. hope you like it! Supernaturally looks really good! Great mailbox! I hope you enjoy all you got! I love how all four of them have a reddish tinge to the cover... I totally didn't plan that. Love Holly Black's series--hope you do, too. Great set! I can't wait to read Supernaturally. I loved Forever and Red Glove. Those are definitely some good ones to make room for! Can't wait for Supernaturally-- and yeah, I do the same thing, when I don't feel like waiting for something to come into the library I just go and buy it :) Hope you enjoy them! Oh looks like you picked up some good ones. I hope you got a good deal! :-) I'm noticing they are all book which belong to a series, which series are you enjoying the most out of the four? I've not read any of them. I loved The Forest of Hands and Teeth but have yet to read the second book. But if the second and third book, The Dark and Hollow Places are anywhere near as good as the first book, I know I'll like them!